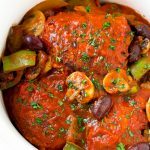 This slow cooker chicken cacciatore is tender chicken thighs that are cooked in the crock pot with peppers, mushrooms and olives. An easy Italian dinner that’s perfect served over pasta! Chicken cacciatore is one of my go-to dinner recipes. My kids happily eat it, it’s got a ton of flavor and it’s so easy to make. This slow cooker version takes just minutes to put together and you’ll come home at the end of the day to a restaurant quality meal. I just love a good meal I can throw in the crock pot. Especially when it’s like this slow cooker chicken cacciatore which my entire family loves. 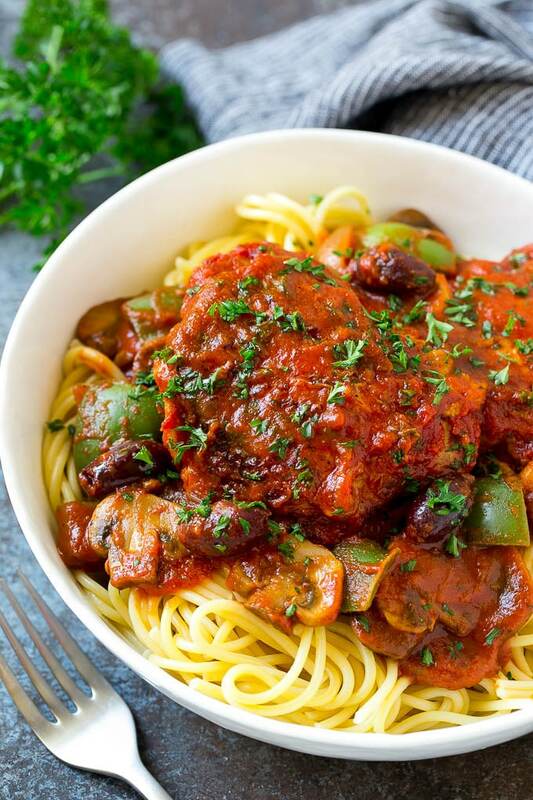 It’s not always easy to find one meal that everyone is head over heels for, but this crockpot chicken cacciatore really hits the spot. HOW DO YOU MAKE SLOW COOKER CHICKEN CACCIATORE? 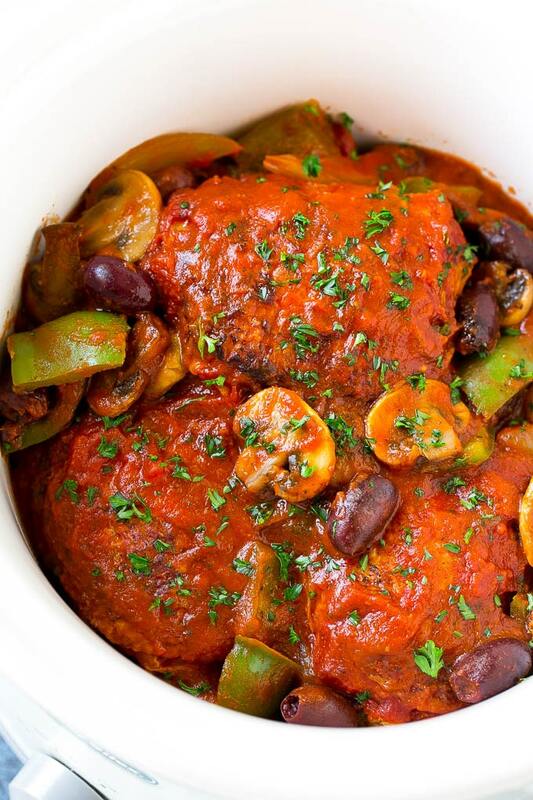 This dish contains a delicious mixture of bone-in chicken thighs cooked to perfection amid the aromatic flavors of peppers, mushrooms, and olives in the crock pot. Italian chicken cacciatore is the perfect hearty dinner that’s both easy and satisfying. Serve it over pasta to round out your meal and up the kid friendly factor! 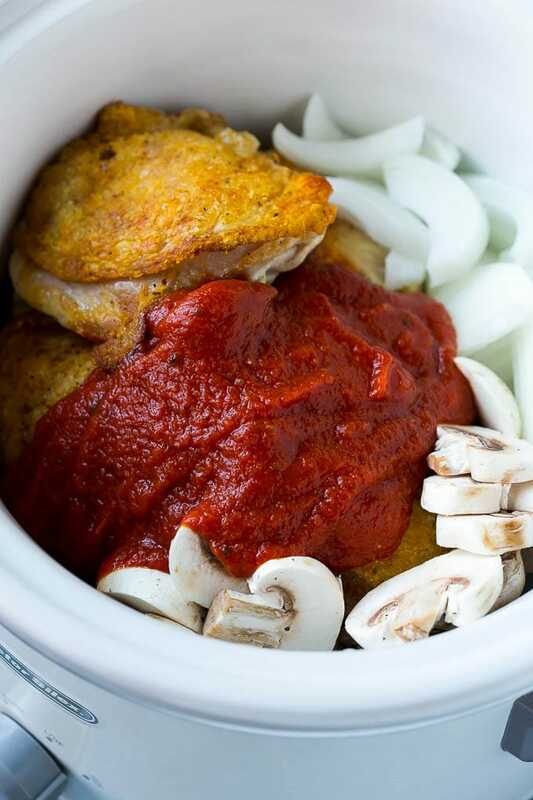 I prefer using bone-in and skin-on chicken thighs when making crock pot chicken cacciatore. This type of chicken holds a ton of flavor and doesn’t dry out or lose its shape after a long cooking time. You can substitute boneless skinless chicken breasts or thighs – your meat may fall apart a bit when you go to serve it, but it will still be delicious. I highly recommend browning your chicken before it goes into the slow cooker, but if you’re in a big hurry, you can skip that step and it will still be great. If you have a favorite brand of marinara sauce, definitely use that in your dish. I use Newman’s or Classico brand. The bell peppers and mushrooms will get quite soft from being in the slow cooker all day. If you prefer firmer veggies, add them about 2 hours before the chicken cacciatore is done. I stir in the olives at the very end right before serving. WHAT DOES THE WORD CACCIATORE MEAN? This word means “hunter” in Italian. In the culinary world, this usually means that a meal is prepared “hunter-style.” Hunter-style means prepared with onions, bell peppers and herbs. This word also means a dish that is typically cooked in a spicy tomato sauce. CAN CHICKEN CACCIATORE BE MADE WITH OTHER MEATS? As with most meals of this nature, just about any meat can be substituted in place of the chicken. The flavors and cooking times will definitely adjust so be aware of this when making your substitutions. A great substitution would be slices of pork tenderloin or other cuts of chicken such as chicken drumsticks. I typically serve slow cooker chicken cacciatore over pasta, but it’s also delicious over rice or mashed potatoes. I will definitely be making this again in the near future! 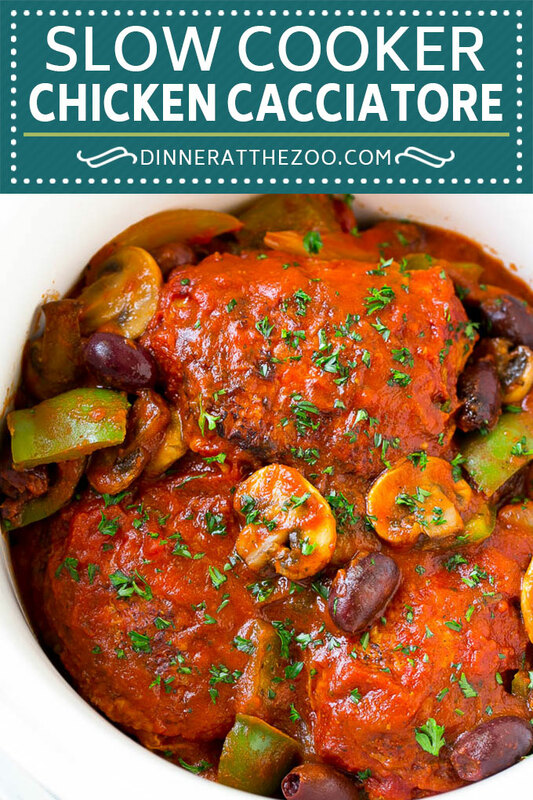 This slow cooker chicken cacciatore is tender chicken thighs that are cooked in the crock pot with peppers, mushrooms and olives. An easy Italian dinner that's perfect served over pasta! Heat the olive oil in a large pan over medium high heat. Season the chicken on both sides with salt and pepper. Cook the chicken for 4-5 minutes per side, or until golden brown. 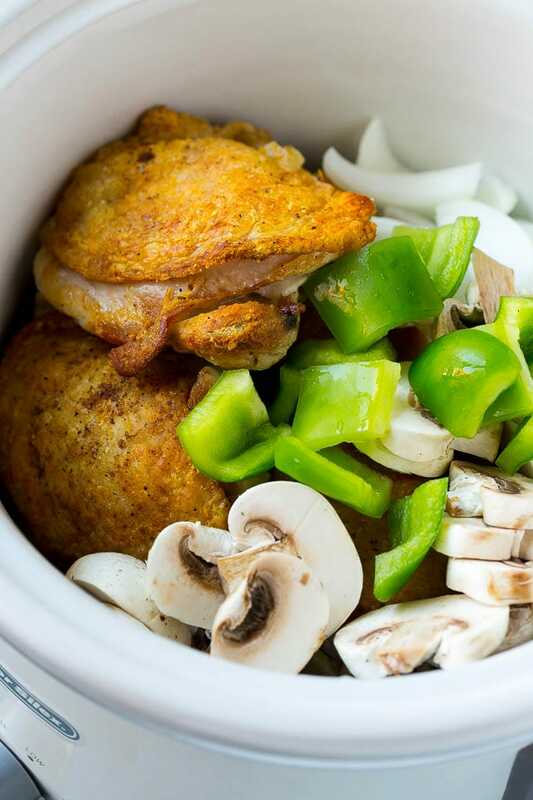 Add the chicken to a slow cooker along with the mushrooms, onion and green bell pepper. Season the vegetables with salt and pepper to taste. Add the Italian seasoning and marinara sauce to the slow cooker. Gently toss all the ingredients together. Remove the cover and stir in the olives. Sprinkle the parsley over the top and serve. Loved the recipe but had just one issue. The sauce turned extremely watery unlike what it looks like in the picture. Did anyone else have this issue and what can I do about it? Thanks for reporting back Steve, I’ll look into it. What brand sauce did you use? My family always loves the classic dishes like this! Crook pot meals are a favorite of mine after a long work day. This is a kind of dish I won’t get tired having for dinner. I would love to give it a try. I love that you are using bone in skin on thighs! It looks so yummy. I’m all about anything I can make in my slowcooker! That sounds like a great combination of flavors. I’ve never made this dish before, and it sounds wonderful. I’ll have to try this out some time. I like chicken cacciatore so much. I never thought to make it in the slow cooker. This looks amazing and is going on our meal plan. This recipe looks so yummy. I haven’t had chicken cacciatore in so many years. My family would love this recipe. I always love when I can use my slow cooker. This looks so amazing. I’ll be trying it out for dinner soon. It’ll make the house smell amazing! I order this dish from a famous Italian restaurant all the time. I gotta try the homeamde version!! This looks delicious. I love Italian food, and I want to extend my recipes. I have to add this one now! This brings me back to my childhood. My mom would make a chicken cacciatore almost weekly and I always loved it. I cannot wait to try this slow cooker version! YUM! 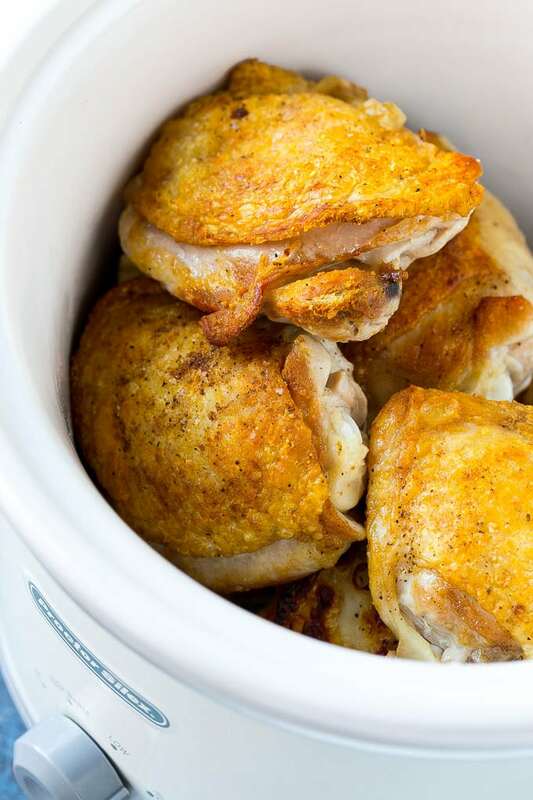 I have seen this Recipe many times but I haven’t ever tried it as I am not sure my husband and son would eat this new way to prepare chicken. But I might make it to take to school when we host the Teachers appreciation day. I haven’t made chicken cacciatore in years. I would love to make it in my slow cooker… or my Instant Pot. Those are my 2 got to kitchen appliances. I have a brand new stove and hardly ever use it. I love slow cooker meals. I use my slow cooker a lot and I’m always looking for new chicken recipes and this one is definitely a winner! I haven’t had chicken cacciatore in a very long time. I love that you used a slow cooker. This will be the perfect recipe to test out with my daughter. Pinning for later!! My husband used to love chicken cacciatore when he could eat mushrooms. The slow cooker is great to use because you don’t heat up the house cooking. My mom used to make chicken cacciatore all the time and I haven’t had it in a million years. I am going to have to try your awesome recipe.